for a Marie Antoinette Mail Art swap. I've been moving real slow lately. then I can show it. how pretty your tags are Debi!!! Oh Debi they are just lovely; as is all of your work. Its so nice to visit your blog...feels like "Princess Land" ! Oh these are so romantic and pretty! The pink is delicious. The lace at the bottom makes them extra pretty. GORGEOUS tags, Debi--can't wait to see your swap! Love these! So pink and feminine and . . . PERFECT! Nobody warned me how addicting swapping becomes. I'm working on a BIG triple swap - oh my gosh I am so excited! It needs to be mailed by 5-29 . . . I think I've gotten it figured out . . . need to hit the flea market this Sunday and see if I can find some last minute must-haves to complete it all. Now aren't they the cutest things!! Such Beautiful atc's so soft and delicate. You'll have some happy swappers no doubt! Your ATCs are beautiful. I love the pretty teacups and the lace trim. YES! I did find my Tea cup! Great post! I just want to say that there are people who didn't recognize the opportunity in their life but still succeed. And other people who recognize it but still failed because they're afraid to explore and try it. Keep posting! Beautiful is how beautiful you can realize if you visit this site. All of the picture you have attach is so nice. 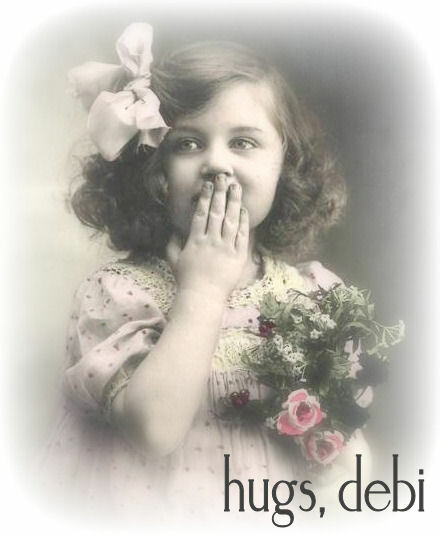 Oh Debi they are just lovely; as is all of your work. Its so nice to visit your blog...feels like "Princess Land"